The name of this non-profit Corporation shall be the Appraisers’ Coalition of Washington. 2.1 To educate and communicate with members of the appraisal profession or with any persons concerned with valuation of real or personal property in Washington about legislative and regulatory issues. 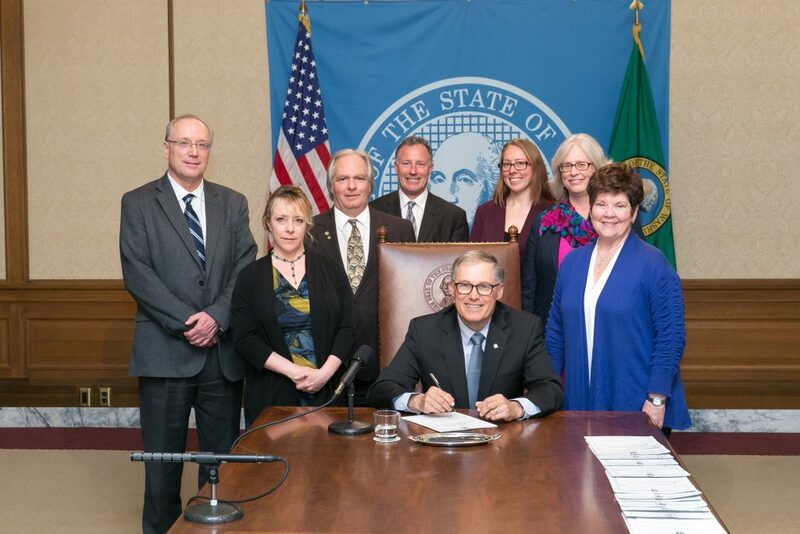 2.2 To support the maintenance and improvement of The Uniform Standards of Professional Appraisal Practice (USPAP) and its effective enforcement by the State of Washington. 2.3 To foster and promote the appraisal profession to the general public through education, research, and publications. 2.4 To raise the funds necessary to administer the activities of this non-profit Corporation and to use such funds to carry out the purposes and objectives of this non-profit Corporation. There shall be three classes of members of this non-profit Corporation. The first class of members shall be identified as “Organization Members” and be comprised of each established Washington Chapter of all appraisal organizations that are member organizations of the Appraisal Foundation Advisory Council, plus one state-wide chapter equivalent comprised of the entire body of non-affiliated appraisal professionals identified in Section 3.2. The second class of members shall be identified as “Individual Members” as described herein and shall be comprised of all individual members in good standing of the first class or non-affiliated appraisal professionals that wish to belong through this class. The third class of members shall be identified as “Allied Members” and shall be comprised of any individuals or organizations other than appraisal practitioners wishing to ally with and provide support to this non-profit Corporation. Allied Members shall be admitted to membership by a two-thirds (2/3) vote of the Board of Directors of the non-profit Corporation. Each Organization Member shall be entitled to representation on the basis of the number of established chapters that each appraisal organization has in the State of Washington. Voting shall not be by proxy. Voting may be by voice vote or in writing (mail or fax, not email), as established by such rules and regulations adopted by the Board of Directors for the conduct of its various meetings. A quorum shall be met when a 50% margin of Organization Member representatives or Directors (depending on meeting type) is present. Organization Member representatives may hold meetings either in person and/or by interactive technology, so long as all representatives participating in the meeting can communicate with one another. Interactive technology includes, but is not limited to, conference telephone, electronic transmission, Internet usage, or remote communication. Action taken at a conference telephone meeting shall be as effective as if the representatives or Directors had met in person. Except as otherwise expressly provided in these Bylaws, any action required or permitted to be taken by the Board of Directors may be taken without a meeting if all members of the Board of Directors consent in writing to waive the meeting. A member of the Board of Directors may provide such written consent in electronic form (other than email). Any action by written consent shall have the same force and effect as any other action of the Board of Directors. All written consents shall be filed with the minutes of the meetings of the Board of Directors. Organization Members shall be represented by one named representative from each Washington chapter of all appraisal organizations in the state whether or not the organization has a chapter in Washington. Named representatives shall be the only members entitled to vote on issues put to the membership of the non-profit Corporation. Each Member Organization shall select one representative prior to each annual general membership meeting of the non-profit corporation. The failure of any Organization Member to select a representative or to attend the annual general membership meeting shall in no way invalidate or impair the proceedings. Individual members shall not be entitled to vote on issues put to the membership, but shall be entitled to attend all general membership meetings and all Board of Directors meetings. Allied members shall not be entitled to vote on issues put to the membership but may, at the discretion of the Board of Directors, attend general membership meetings and Board of Directors meetings. 6.1 Dues shall be collected by the non-profit Corporation from Organization Members on a per-capita basis and from Individual Members as may be determined by the Board of Directors. The Board of Directors shall be comprised of six (6) named representatives of the Organization Members. The number of Directors may be changed by amendment to these Bylaws, but a decrease in the number of Directors shall not shorten the term of any incumbent Director. The Directors shall be elected by the named representatives of the Organization Members at each annual general membership meeting, to hold office until the next annual general membership meeting and until their respective successors are elected. In the selection of Directors, the named representatives of the Organization Members and the representative referenced in Article 5.2 shall be given preference. However, if all Director positions cannot be filled by named representatives of the Organization Members, Directors may be elected from the Individual Member class, provided that no more than two members from any one Organization Member may serve as a Director or Officer at any one time. Directors duly elected at an annual general membership meeting shall serve until the next annual general membership meeting unless they are replaced by action of the member organization they represent. Except as otherwise provided by law, vacancies on the Board and newly created Directorships resulting from any increase in the authorized number of Directors shall be filled by the affirmative vote of a majority of the directors then in office or by the sole remaining Director. A Director elected to fill a vacancy shall be elected for the unexpired term of his predecessor in office. Any Directorship to be filled by reason of the increase in number of Directors may be filled by the Board of Directors for the term in office continuing only until the next election of Directors by the membership. A Director may resign at any time by delivering written notice of resignation to the Secretary of the Corporation or, if the secretary cannot be found, to the President or registered agent of the Corporation. The resignation shall be effective upon the receipt by the Secretary/President or registered agent as the case may be. The business and affairs of the Corporation shall be managed by the Board of Directors. The Board of Directors shall exercise all of the powers of the Corporation except those which by law, the Articles of Incorporation or these Bylaws are conferred upon or reserved to the members. Powers which are by law given to the members but which have been conferred upon the Directors in the manner authorized by law shall be exercised by the Directors. The Board may adopt such rules and regulations for the conduct of its meetings and the management of the Corporation as it may deem proper and which are not inconsistent with Statute, Articles of Incorporation, or these Bylaws. The meeting of each newly elected Board of Directors, to be known as the annual meeting of the Directors, shall be held immediately after the annual general membership meeting or any special membership meeting at which a Board of Directors is elected, provided all Directors are present, or those who are not present thereat waive such notice for the meeting. Said meetings shall be held at the same place as the general membership meeting unless some other place shall be specified by resolution of the membership. No notice of the annual meeting of the Board of Directors shall be necessary. Other regular meetings of the Board of Directors may be held at such place and on such day and hour as shall from time to time be fixed by resolution of the Board, without notice other than such resolution. The officers of the Corporation shall be a President, one Vice President, a Secretary, and a Treasurer, all of whom shall be elected by the Board of Directors and shall hold office at the pleasure of the Board. The Vice President, Secretary and Treasurer shall be elected from the membership of the Board; the President may be elected from either the Board of Directors or from the entire body of Individual Members. The officers shall be elected at the annual meeting of the Board of Directors following the annual general membership meeting. The President shall be an ex officio member of the Board of Directors, having full voting privileges on the board. The President shall preside at all meetings of the Board of Directors and of the membership, and shall have and perform all such other duties as from time to time may be assigned by the Board of Directors. The President shall have the usual executive powers pertaining to the Office of President, including the general supervision, direction, and control of the business of the Corporation and the responsibility to carry out the resolutions adopted by the Board of Directors subject at all times and in all manners to the direction and control of the Board of Directors. In the absence or disability of the President or in the event that for some reason that it is impractical for the President to act personally, the Vice President shall have the powers and the duties of the President. The Vice-President shall have such other powers and duties as shall be assigned by the President or the Board of Directors. The Secretary shall give, or cause to be given, notice of all meetings of the membership and of the Directors, and all other notices required by law or by these Bylaws. The Secretary shall record all of the proceedings of the meetings of the membership and of the Directors. The Secretary shall keep a record of the membership of the Corporation and of the addresses of the membership. The Treasurer shall have custody of the corporate funds and securities and shall keep full and accurate accounting of receipts and disbursements in books belonging to the Corporation. The Treasurer shall deposit all monies or valuables in the name and to the credit of the Corporation in such depositories as may be designated by the Board of Directors. The Treasurer shall disburse the funds of the Corporation as may be ordered by the Board of Directors or the President taking proper vouchers for such disbursements. The Secretary shall render to the President and the Board of Directors at the regular meetings of the Board of Directors or whenever they may request it and to the membership at the annual meeting of the membership, an account of all of the Treasurer’s transactions and of the financial condition of the Corporation. The Treasurer shall also perform such other duties as may be assigned by the President or the Board of Directors. Vacancies in any office arising from any cause may be filled by the Board of Directors at any meeting of the Directors. Any officer, employee or agent of the Corporation may be removed by a two-thirds (2/3) votes of the Board of Directors with or without cause. The annual general membership meeting of the members of the non-profit Corporation shall be held on the first Monday Thursday following the first Tuesday of December or such other date as may be determined by the Board of Directors. The place of the meeting shall be designated by the Board of Directors at least sixty (60) days prior to the meeting date. The purpose of the annual meeting shall be for the election of Directors and for the transaction of such other business as may come before the meeting. Special meetings of the membership may be called by the President or the Board of Directors or by more than 50% of the named representatives of the Organizational Members. The place, day and hour shall be as fixed by the caller of the meeting. No business shall be transacted at the meeting except as specified in the notice calling the meeting. Written notice stating the place, day and hour of the meeting and, in the case of a special meeting, the purpose or purposes for which the meeting is called and the name of the persons by whom or at whose direction the meeting is called shall be delivered to each member of record entitled to vote at such meeting not less than ten (10) and no more than sixty (60) days before the date of the meeting either personally or by mail or by or at the direction of the President, Secretary, or persons calling the meeting. If mailed, such notice shall be deemed to be delivered when deposited in the United States mail, addressed to the member at this/her address as it appears on the membership roster of the Corporation, with First Class postage thereon pre-paid. Notice of any membership meeting, whether required by law, the Articles of Incorporation or these Bylaws, may be waived in writing by any member at any time either before or after the meeting. Attendance of a member at a meeting shall constitute a waiver of notice of such meeting except where a member attends a meeting for the express purpose of objecting to the transaction of any business because the meeting is not lawfully called or convened and gives written notice of objection to the Secretary prior to the commencement of the meeting. The Bylaws may be amended, altered, or repealed or new Bylaws adopted at any annual or special meeting of the membership if notice of the proposed alternation or amendment is contained in the notice of the meeting and states that a proposal to such effect will be voted upon at the meeting. The language of any proposed amendment, alternation, or new Bylaw need not be set forth in such notice. These Bylaws may be amended, altered or repealed or new Bylaws adopted by an affirmative vote of two-thirds (2/3) of the whole Board of Directors at any regular or special meeting of the Board if notice of the proposed alteration or amendment is contained in the notice of the meeting; provided, however, that the Board of Directors shall not amend, alter, repeal or adopt any Bylaw in such a manner as to affect the qualifications, classifications, term of office or compensation of the Directors in any way. Any action of the Board of Directors with respect to the amendment, alteration or repeal of these Bylaws or adoption of any new Bylaws is hereby made expressly subject to change or repeal by the membership.